The bird, from the Notably Ornate stamp set, is popped up on dimensionals to look as if he's carrying the bauble. And have you spotted the frame? It's from the stocking image in the Gifted set and I just can't stop using it! Colour the frame from the stocking image in the Gifted stamp set with an Early Espresso marker. Stamp it on Sahara Sand card stock and trim round the frame. Sponge the edges with Whisper White craft ink. 'Colour' the bauble on another stamp from Gifted with a versamark pen. 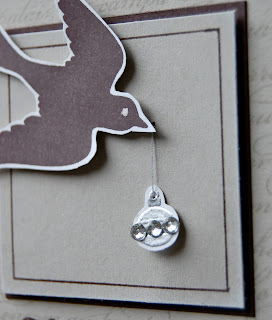 Stamp onto a scrap of Whisper White card stock and heat emboss with silver embossing powder. Decorate with rhinestones and cut out. 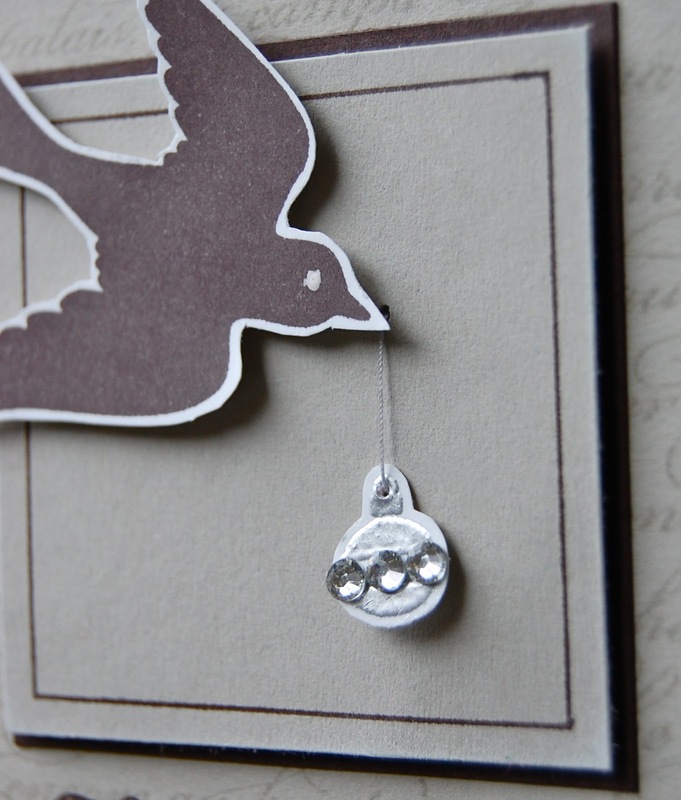 Pierce a hole in the top of the bauble and sew onto the frame with silver cotton. 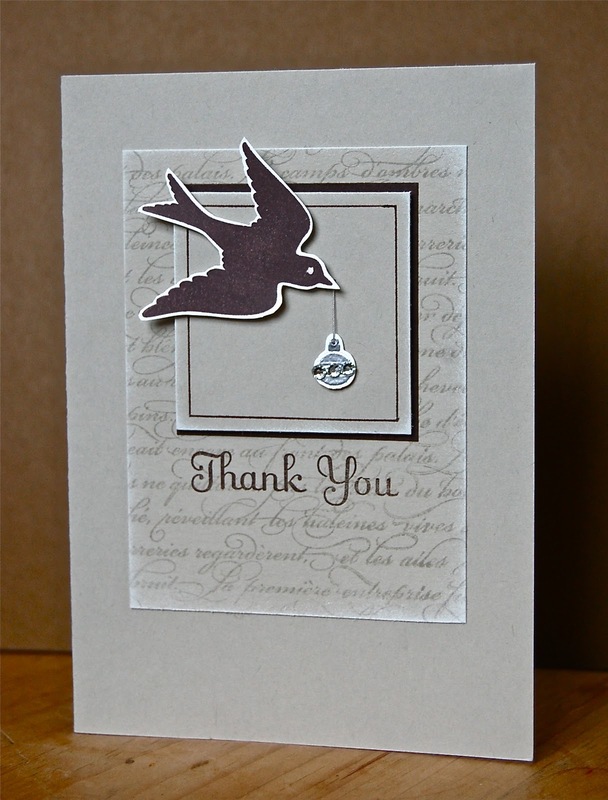 Stamp the bird from Notably Ornate using Early Espresso ink on a scrap of Whisper White card stock. Cut out using sharp paper snips and attach to the frame with dimensionals. Add an eye with a white gel pen. Cut a piece of Early Espresso card stock slightly larger than the frame and mount the frame panel onto it. Cut a piece of Sahara Sand card stock 8cm wide x 10cm high. Ink up the En Français background stamp with Sahara Sand ink and stamp onto the card stock. Sponge the edges with Whisper White craft ink. Stamp a sentiment in Early Espresso ink, using a stamp-a-majig for accurate placement then add the bird panel. Fix this to an A5 card blank. Well, that's it - out come the tissues! Not everyone is looking forward to a happy Christmas with a loving family in a warm, comfortable home and it's right to be reminded of that. I love the color combo. It is elegant. Love the layout, the script background and the way the bird is holding the ornament. I love this card, Vicky. The color combination is very sophisticated and the way you combined the different sets is pure genius! I think it's good to be reminded that, yes, while it's less expensive (and takes less thought) to operate from one set at a time, that buy combining the sets you own you really get more bang for your buck -- plus you can breathe new life into some of your older sets. And, I'm such a sap at children's singing programs. I know I'll have to avoid looking at the children or the parents next week when the 3, 4, and 5 year olds are performing their musical. I'm narrating so I really can't be sniffling, like I'm inclined to when they're singing "There is Room in My Heart for Jesus" and holding their little hands over their hearts -- real potential to undo me! Hey, I was just taking another quick look at this card (I love it so! ), and didn't you use 4 sets? That sentiment looks like one from Thank You Kindly (at least that's the name of the set in the U.S., I think). Oh Vicky, this is so elegant and sophisticated. I`m with you on the emotional front at childrens carol concerts ( or any other concerts for that matter). Our local Morrisons usually have a childrens choir around this time and Alan has to whisk me away before I start blubbing. Great card Vicky, love the way you've raised the bird to "carry" the bauble. So touched by that lovely song you shared. Merry Christmas! I liked this card so much I cased it. Check out my blog to see my interpretation. Thanks for the inspiration.